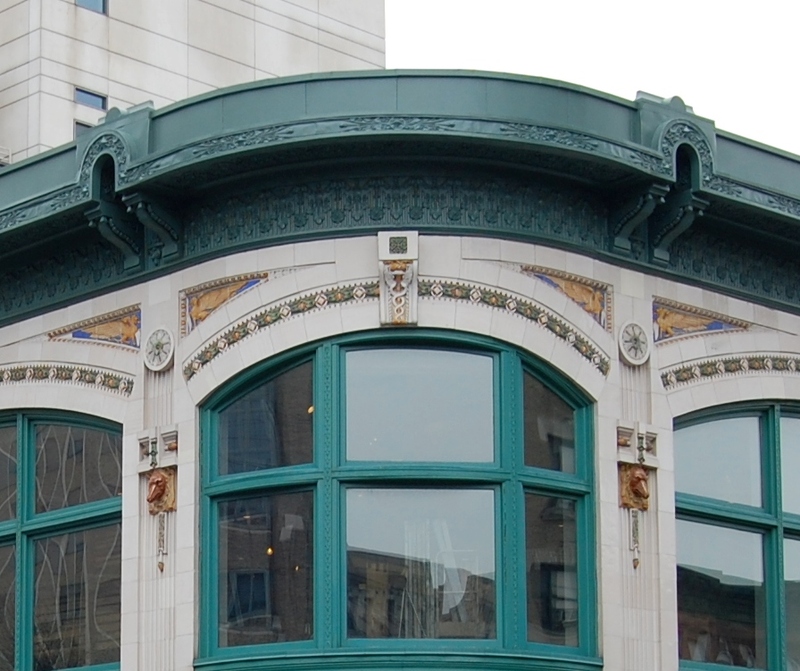 Daytonian in Manhattan: The Remnants of the 1912 Audubon Theatre and Ballroom --Broadway at 165th St. The Remnants of the 1912 Audubon Theatre and Ballroom --Broadway at 165th St. In 1912, three years before he would immortalize his name by founding the Fox Film Corporation (later to become 20th Century-Fox), the Hungarian-born William Fox embarked on an ambitious project in the rapidly-developing Washington Heights. The area was ripe for a multi-functional entertainment venue and Fox sought out the services of theater architect Thomas W. Lamb to fill the void. 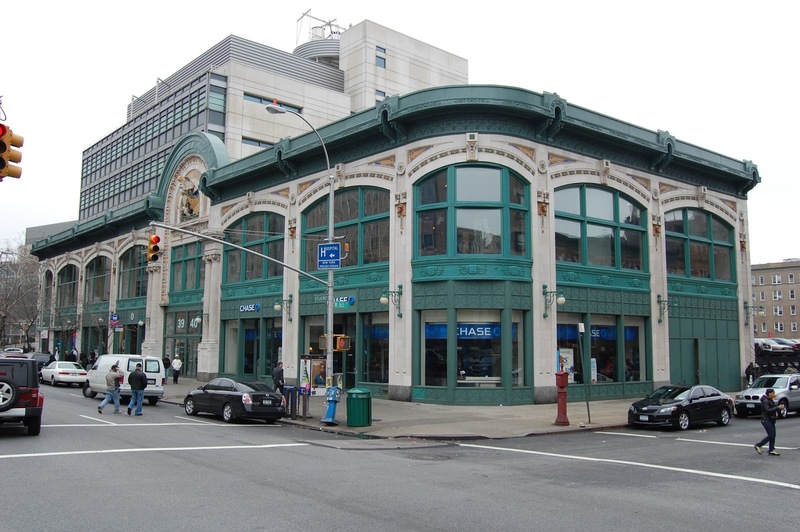 Filling the block on Broadway between 165th and 166th Streets, the dual-purpose Audubon Hall opened for business on November 28, 1912. Lamb had created a 2,368-seat theater on the first floor, and on the second a “ballroom” and an assembly-type room that seated 200 persons. Lamb lavished the two-story structure with mythological imagery and Roman-inspired motifs. 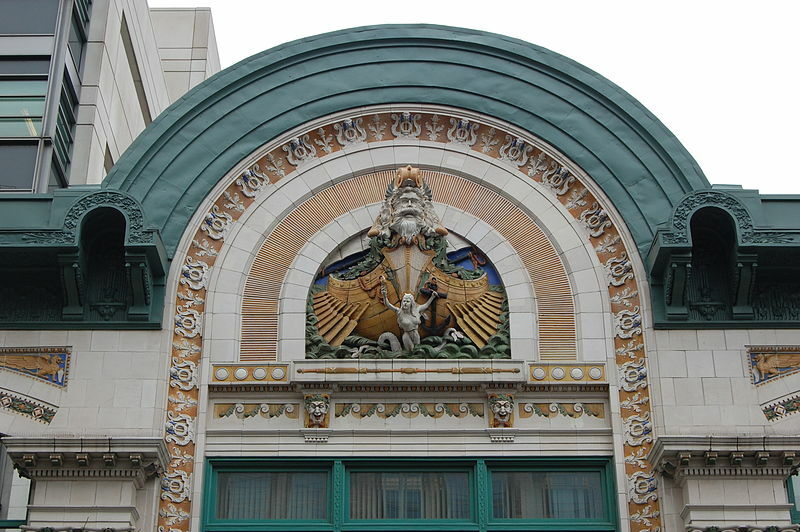 The colorful terra cotta façade featured griffins in the spandrels of the rhythmic two-story arches that defined the building. Above the entrance an immense head of Poseidon served as the figurehead to an approaching Roman galley, before which a mermaid swam toward the passerby. Paired monumental Roman columns flanked the entrance and, with a nod to the dramatic arts inside, a series of lyres lined the grand arch. Colorful satyr heads appeared throughout the design—over the entrance, within the lyres of the arch, and within the column capitals, for instance. The architect strayed from the mythical theme by including full-relief terra cotta fox heads between each arch, an obvious nod to his patron. Inside Lamb carried on the Roman motif. Reportedly the auditorium boxes featured satyr heads flanked by maidens. 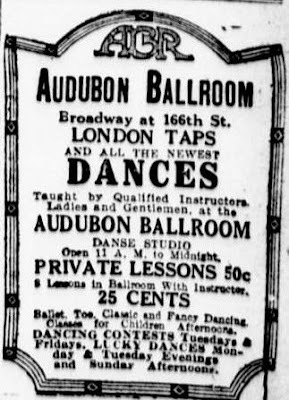 While vaudeville played downstairs, the Audubon Ballroom upstairs offered dance lessons, including all the latest fads, and events like dance contests. The Ballroom was managed by George D. Grundy, a master of marketing who packed the space through special events. He scored a coup in January 1919 when he lured the Dancing Carnival away from the Grand Central Palace where it had been traditionally held. By 1921 the Audubon Theater was offering motion pictures as well as vaudeville. One of the acts during Christmas Week that year involved trained seals. Early in the morning of December 27 fire broke out in the cellar of the Corn Exchange Bank next door. The fire spread rapidly into the Ballroom. Meanwhile firefighters fought to save the theater portion. “Firemen kept the flames from the Audubon Theater, a motion picture and vaudeville house, at the south end of the building, and rescued, much against their will, three trained seals which were backstage in their cages,” reported the New-York Tribune. The New York Times reported that several firemen were hurt fighting the blaze. The Ballroom “was put out of commission” and the lobby of the theater was heavily damaged by water. With the Ballroom repaired, George Grundy jumped at the latest fad of the Roaring Twenties: the dance marathon. The craze had swept the country’s large cities and young men and women vied to capture the endurance title. The problem was that communities, including New York City, began outlawing the contests out of concern for the dancers’ physical well-being. On Saturday March 31 at 6:57 p.m. Alma Cummings started dancing. As George Grundy kept vigil, the 32-year old Alma (whose real name surname was Stappenback) danced the fox trot, waltz and one-step with one young man after another. When the band quit for the night, two phonographs kept the music playing. The achievement sparked perhaps the most astounding incident in dance marathon history. A month later a group of young people started dancing here in an effort to crush Alma’s record. After 28 hours and 50 minutes there were still five men and three women dancing. And then word arrived that the police were on the way. Parents and friends rushed to obtain a moving van. The phonographs were taken aboard and the contestants danced their way into the van. The hoofers danced inside the van as it took them to the ferry to New Jersey. Once on the other side of the Hudson, another van moved them to the Pekin Dance Hall in Fort Lee, New Jersey. But they were met by expectant police who made them move along. Inside the van the dancers continued moving while they were transported to East Port Chester, Connecticut. Local police allowed the last remaining dancer, Vera Sheppard, to continued until dawn broke on Sunday morning. At that point they had to invoke the blue law and stop her dancing on the Sabbath. Vera Sheppard had clearly broken the Alma’s record. When she returned to the Audubon Ballroom (having danced through three states, a ferry boat and four moving vans) she received the unhappy news that simultaneously a girl in Cleveland, June Curry, had beaten her record. The building caught fire again on January 12, 1927 while 800 people were viewing a motion picture. As smoke entered the auditorium the patrons, many of them children, calmly gathered their belongings and filed out through emergency exits. The organist, according to The New York Times the following day, played “Home Sweet Home” to keep the crowd calm. The three-alarm fire resulted in between $150,000 to $200,000 in damage to the auditorium and ballroom. “The building, which is two stories high and of masonry, was burning throughout almost all its interior save the theatre auditorium,” said The Times. Not all the events in the Ballroom during the Roaring Twenties ended happily. On September 21, 1929 the Lantern Athletic Club hosted a dance. Uninvited, 18-year old Betty Marshall and her date, 27-year old Jack King, crashed the party. The intrusion did not go unnoticed and King became involved in a confrontation with club members. Shots were fired and Betty Marshall was shot in the chest and King in the shoulder. Two stray shots hit the wall behind the pair. On April 30 that year the gang rented the Audubon Ballroom to throw a going-away party for a friend inducted into the Army. The Times reported that they “invited 100 guests and made sure they had a supply of meat by stealing fifteen hams from the Swift & Co., plant at Twelfth Avenue and 131st Street. After World War II the Audubon Theatre became the Beverly Hills Theater. Later it was the San Juan, a Spanish movie house which finally closed in 1975. Death and violence came three days later when the 39-year old stood up at the Audubon Ballroom to address the Organization of Afro-American Unity. He was gunned down by assassins later identified as Black Muslims. His death, however, became a sort of martyrdom that raised him to a symbol of black pride. 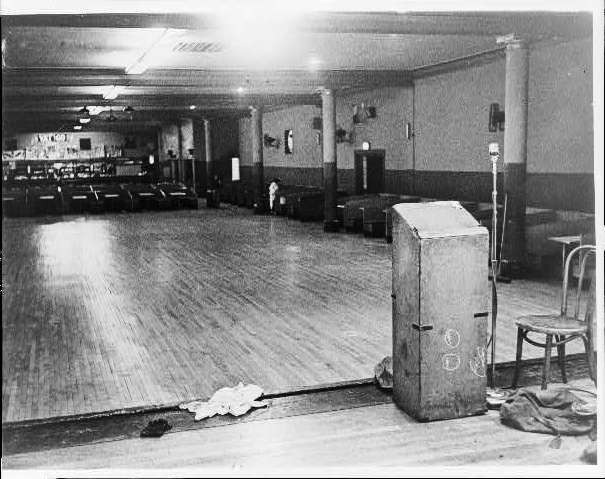 Throughout the 1970s the care-worn Audubon Ballroom above the empty theater was a favorite venue for prize fights. Eventually, though, that too closed and, having been taken by the City for back taxes, the old William Fox Theatre Building sat empty and deteriorating. The announcement sparked protests from African American community activists, preservationists and Columbia University students. Even after demolition began the protest waged on, with Manhattan Borough President Ruth Messinger among its most outspoken leaders. 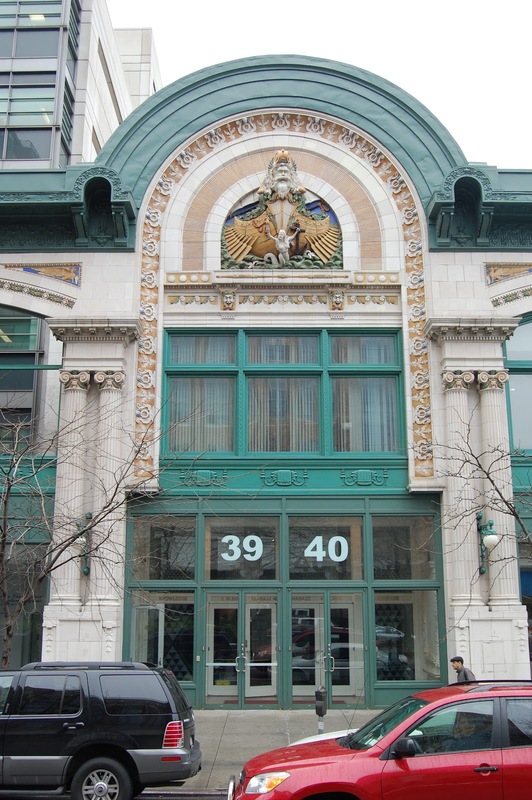 Despite the newspaper’s ranting, a compromise was reached to preserve about two-thirds of the original face and about 40 percent of the remaining Ballroom. An excruciating $7 million restoration was initiated on the exterior and what was left of the Ballroom. In 2005 the Malcom X and Dr. Betty Shabazz memorial and educational facility opened while behind the six-story Center for Commercial Biotech Research building, designed by Davis, Brody & Associates was erected.